The final edition of News of the World -- Britain's biggest selling newspaper -- rolled off the presses this weekend. The newspaper repeats apologies for phone hacking, calling it "appalling wrongdoing"
London (CNN) -- Media magnate Rupert Murdoch flew into London Sunday, hours after the final edition of the News of the World hit the stands, forced to close by a scandal over illegal eavesdropping and bribery that has outraged Britain. He was seen reading the last issue of the best-selling newspaper that launched his career as an international press baron as he arrived at the headquarters of News International, the British newspaper-publishing subsidiary of his News Corporation. He did not plan to make a statement Sunday, News International told CNN. The scandal seems unlikely to die down despite the dramatic and abrupt closure of the 168-year-old newspaper, with the family at the center of some of the most shocking allegations against it meeting the heads of all three major political parties this week. The family of murdered teen Milly Dowler will meet Deputy Prime Minister Nick Clegg, a Liberal Democrat, on Monday. They sit down with Labour leader Ed Miliband on Tuesday and Prime Minister David Cameron, a Conservative, on Wednesday, lawyer Mark Lewis told CNN. The accusation last week that people working for News of the World illegally listened to phone messages left for Milly Dowler, 13, between her disappearance and the discovery of her body in 2002, proved a tipping point in the scandal. The Dowlers were deeply upset by the "self-congratulatory" final issue of the 168-year-old newspaper, Lewis said. "The front cover would have been so much better if it said sorry" he said. "There is nothing in that newspaper that has the good grace to say, 'We really got it wrong and want to say sorry to these people." Murdoch's son James, the chief executive of News International, announced Thursday that the paper would close. 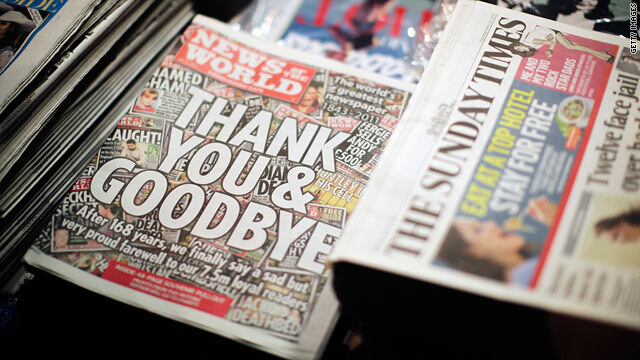 Plastered with a montage of recent front pages across its cover, and with a reproduction of its first front page from 1843 on the inside, the News of the World struck a wistful yet proud tone in its final editorial Sunday. And it repeated its owner's apology for the criminal activities that brought the 168-year-old paper down. The paper welcomed Cameron's call for two different inquiries, one into how police investigated the allegations of phone hacking, and a separate one into the ethics and standards of British journalists. It did not apologize on its cover and the apology took up only a few paragraphs in its 829-word farewell. Those ensnared in the police investigation include Andy Coulson, a former editor of the paper and an ex-communications director for Cameron. He and the paper's former royal correspondent, Clive Goodman, as well as a 63-year-old man were all arrested Friday in connection with allegations of corruption. Both Coulson and Goodman were released on bail late Friday. The third man, who was not named, was freed on bail Saturday morning. All three were ordered to report to police in October. The scandal has prompted questions over the British prime minister's judgment. Cameron hired Coulson following the journalist's resignation as editor of News of the World after Goodman and a private investigator, Glenn Mulcaire, were jailed in 2007 over hacking. Coulson has always maintained he did not know about Goodman and Mulcaire's use of illegal methods to get information about Prince William and other high-profile figures, but quit because the crime happened when he ran the paper. Analysts say Murdoch will be eager to limit the damage to News Corporation's bid to take over U.K. satellite broadcaster BSkyB, which has been placed in question by the allegations against News International. British Culture Secretary Jeremy Hunt will consider the impact of the News of the World's closure as he reviews its bid for BSkyB, his office said Friday. Labour and Liberal Democrat politicians Sunday morning lined up to oppose Murdoch's efforts to take over BSkyB, in which he already owns a controlling interest. Labour leader Miliband called for a vote in parliament on the issue, and Liberal Democrat Simon Highes -- a victim of phone hacking himself -- told Sky News the best solution would be for Murdoch to withdraw his bid. Staff of the scandal-hit paper emotionally departed their London newsroom for the last time Saturday night, proudly holding up the final edition of the tabloid. The paper's roughly 200-member staff are now out of jobs, but have been told they can apply elsewhere within its parent company, News International. News of the World showbiz editor Dan Wootton posted on Twitter that 5 million copies were being printed Sunday, twice the usual circulation of 2.5 million. James Murdoch said all revenue from the last edition would go to "good causes" and that free advertising space would be offered to charities. But the paper itself said Sunday that "profits" -- not "revenues" -- would go to charity. News International spokeswoman Daisy Dunlop Sunday confirmed that was correct. A News International source said in practice that meant 74 pence of every pound of the newspaper's cover price would go to charity. The other 26 pence goes to the retailer who sells the paper and the wholesaler who delivers it, said the source, asking not to be named discussing internal corporate business. The newspaper listed three recipients: the children's charity Barnardo's, the Forces Children's Trust, and "military projects at the Queen Elizabeth Hospital Birmingham Charity." According to audio leaked to the media, News International's chief executive Rebekah Brooks said in a meeting with staff Friday that she was "determined to get vindication for this paper. And for people like you." But she also told staff that it had to be shut down because worse revelations about its activities were imminent, the U.K.'s Telegraph newspaper reported. Brooks has come under increasing pressure to step down over the scandal, with Cameron saying Friday he would have accepted her reported offer to resign. Police are also investigating evidence that a senior News International executive may have deleted millions of e-mails from an internal archive, according to legal sources cited by the Guardian newspaper. The decision to close the News of the World followed accusations that it illegally eavesdropped on the phone messages of murder and terrorist victims, politicians and celebrities, and claims it may have bribed police officers. Police said Thursday they had identified almost 4,000 potential targets of hacking. Downing Street on Saturday confirmed that Cameron has approached the United Kingdom's judiciary to suggest names for the judge to lead the inquiry into the News of the World hacking claims. News of the World was the first British national newspaper Rupert Murdoch bought, in 1969, as he began to propel himself from Australian newspaper proprietor to international media magnate. In addition to owning News of the World, News International owns the Sun, the Times and the Sunday Times in Britain. CNN's Laura Smith-Spark and Dan Rivers contributed to this report.